As a straight male, how would u feel about your child having a homosexual school teacher?! Who their around 8hours a day ! As a straight male, the best teacher I ever had was a gay man. Among many other things, he taught me the difference between “there,” “their” and “they’re.” His name was Keith Johnson. I would have been absolutely delighted for my daughter to have known him. I sang at his funeral. This tweet, boosted by folks like Neil Gaiman, JK Rowling and Nick Offerman, has now been seen by over three million people. So now I would like to tell you a little bit about Keith Johnson, the best teacher I ever had. To begin, in 1980, when he was my sixth grade teacher, I had no idea he was gay. It was 1980, when bluntly it wasn’t safe for a teacher to be out (he may have been out to colleagues but I wasn’t aware of it if he was). Also I was eleven years old, and in that time and place, I wouldn’t really have known what it meant to be gay. Not that I hadn’t heard the word or ones like it, which we flung around as slurs — “that’s gay,” “don’t be a fag,” and the game we rather obliviously called “smear the queer,” in which someone caught a ball and then everyone else in the game tried to drive them into the ground. But I didn’t have a very good idea of why those were slurs, nor how those slurs would have been applied to Keith. No, in that time and place, Keith was simply “Mr. Johnson” — not Keith Johnson, mind you, as the idea of calling a teacher by their first name elicited the sort of holy terror that convinced you that if you were to do so you would promptly burst into retributive flame. “Mr. Johnson” would do. It wasn’t until years later that I could even say “Keith” without feeling I stepped over some still-glowing, forbidden line. Keith’s reputation preceded him. 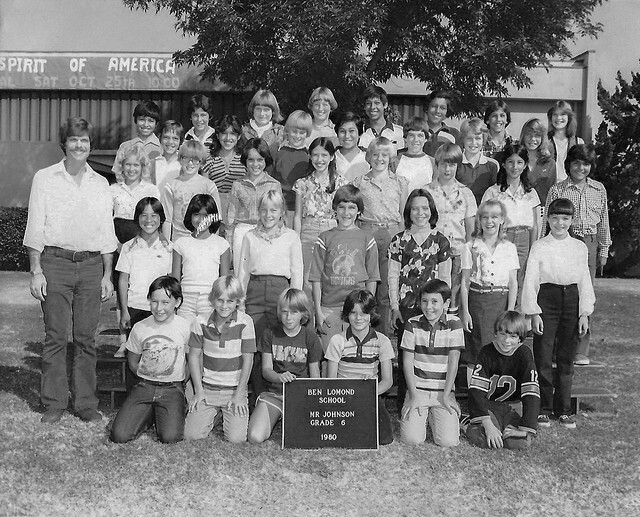 At Ben Lomond elementary’s “MGM” (“mentally gifted minors”) program, the upper grades went through Mrs. Fox, Mrs. Swirsky and Mr. Johnson, for fourth, fifth and sixth grades. Even in fourth grade you heard about what a hardass Mr. Johnson was, how he didn’t suffer fools, and how if you got out of line, you were in for it. He was legendary in a way that elementary school teachers could be: Here was this fearsome leonine visage, and he was coming for you. Well, not coming for you exactly, but one day you would be in his class, and then you would feel his wrath. Sure, you get away with some things in Mrs. Swirsky’s class. But if you tried that in Mr. Johnson’s class? Principal’s office. Or worse. Which, when you was finally ended up in Keith’s class, turned out to be only about 30% true. Certainly, Keith wanted you to pay attention, and if you weren’t, he had a boomy baritone voice which would snap you back into line. And if the entire class was lazy or inattentive, then Keith had a phrase that let us know we disappointed him on a fundamental level. “Boy, I’m telling you, some people,” he would say, loudly and with a slathering of reproach, and then would detail what some people would do, and it was clear that some people were foolish and silly and would eventually lead lives of regret and disappointment, and the genesis of those regretful lives would be now, in this moment, when we weren’t getting our history projects done in a timely way. And it would work, because obviously we didn’t want regretful, disappointing lives, but also because we didn’t want to disappoint Keith. Because here was the thing about Keith. Fundamentally, he wasn’t frightening, or mean, or an indiscriminate hardass on eleven year old kids. He was in fact kind and attentive, and more to the point, he saw each of his students in the way teachers are supposed to, and the way the best of teachers do, seemingly by reflex. He saw us, and saw our quirks and flaws, where we needed encouragement and also what kind of encouragement we would need. He saw us as individuals and as a group, and while he always had the same educational goals year in and year out, it became clear he would get us to those goals in ways that we could get there. Being seen by one’s teacher, as it turned out, was especially important to me in the sixth grade. My mother was having a bad divorce that left me, my mother and my sister briefly homeless and then shuttling around between houses for the rest of the year. There was little stability, emotionally or physically, in my home life, and it would have been easy — and understandable — for me to fall down a hole and not come out of it for a long time. I didn’t because as it happened a number of people stepped up to help save me. One of those was Keith, who in seeing me saw some of the possible paths of my future, and gently but with just the right amount of push, set me on those paths. I’ll give you two examples. The first happened when Keith asked me to write a letter. Every year Keith had his class perform a play (my year it would be “Oliver!” in which I would play the Artful Dodger; I can still sing most of the songs from that play by heart). To pay for it, he would have the class run a small business selling doo-dads to other students and parents. We would do the whole nine yards, including registering the business with the city and issuing stock (and at the end of the year, paying off the stock with dividends, if any), and by naming officers of the corporation. Among the things Keith had us do was publicity, and one day while explaining the concept of publicity to us, he said one of the things he wanted us to do was contact a local TV station and try to get them to do a segment on us for the five o’clock news — and as he was saying this, he turned to me directly, pointed at me, and said “and I want you to write the letter.” Why me? He told me later and privately it was because I wrote differently than everyone else in class and he thought I could make the argument in a way that would interest the news crew. Keith was the first person aside from my mother to see that writing was a thing I did — and the first person to say to me that it was a thing I could do well, in a way that set me apart. It would be a few years until I decided for myself to become a writer, but I never forgot that Keith saw it first in me. Another example I’ve detailed elsewhere, when Keith gave me a copy of Ray Bradbury’s The Martian Chronicles, said to me I would enjoy it, and said to me it was one of his favorite books. For me, this wasn’t just a teacher suggesting a book, it was my teacher sharing a confidence that was for me alone. And again he was right — The Martian Chronicles is in many ways foundational to my understanding of a field that I would eventually come to write in. I can’t say I became a science fiction writer because Keith gave me Bradbury’s book. But I can say I believe he understood me well enough to believe that it was the right book at the right time for me. And it was. When I left Keith’s class to middle school, I would still drop by after class to chat with him and catch up; he always seemed pleased that I would come to say hello. I wasn’t the only former student who would do that — others told me they did it as well — but perhaps I was the most persistent, keeping in touch through high school and then college and then in the early parts of my professional career. Somewhere in there I directly asked him if he were gay, because by that time, several years on, some rumors had begun to circulate among his former students. Keith by this time had retired from teaching and told me it was true, named his partner and seemed perfectly at peace with it, and with me knowing. By this time Keith was also sick. He was one of the many gay men who contracted HIV in the early days, before it was well understood and before there was a good treatment regimen for the virus. It developed into AIDS and he died of it, as did hundreds of thousands of gay and other Americans (and as do thousands still do, even today). I went to his memorial service, as did a few other of his former students, and at his funeral, with the permission of his family and partner, I sang a song I wrote for him. Keith Johnson was a teacher and I can’t claim that I was more special to him than the hundreds of other students who passed through his classroom over the couple of decades he taught. But I think that’s the point of him being one of the best teachers I’ve known: His skills and talents as a teacher were for everyone, and were there for every student who came through his class. I don’t think I’m alone in saying he was the best teacher I’ve had, and I’ve had some magnificent ones over the years. But he stands alone. To go back to the original question of how I as a straight male would feel about a homosexual teacher with my child eight hours a day, the answer is: A homosexual teacher was my best teacher, was the right teacher for me at a critical time, and saw me when I could have been lost. It’s even possible that in his way Keith Johnson saved me at a time when I most needed saving, simply by being the teacher he was with each of his students. I would have loved to have been able to introduce my daughter, born after he died, to Keith, my teacher and my friend. And I would want my daughter, and for every child, to have a teacher like Keith — one who saw her, one who taught her, and one who helped make her more herself, as Keith did with me. How could one not wish that for one’s child? And now you know a little more about Keith Johnson, at least from my perspective. He was my best teacher. His memory is a blessing.